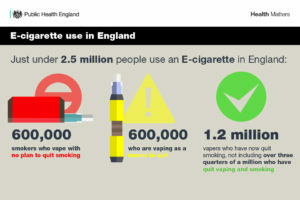 “E-cigarettes are the most popular stop smoking aid in England” according to Public Health England. 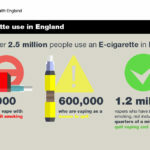 According to the recent study by Public Health England, e-cigarettes are “the most popular stop smoking aid in England”. Interesting research of the long term effects of vaping. Most vapers are still waiting for a long term study that would support the claims that e-liquids and vaping are much better for people than regular cigarettes. Now there is something we can actually show to the sceptics thanks to Dr. Riccardo Polosa. Accoriding to a study that was recently presented on the E-Cigarette Summit in London and published in the Nature journal, vapers that have never smoked regular cigarettes experience no apparent long-term negative health effects from vaping. Research group led by Dr. Riccardo Polosa measured coronary, respiratory and pulmonary vital signs in a group of young vapers with a 3.5 years vaping experience and no prior cigarette smoking history. Similar group of non vapers, no smokers was tested as well as a control group. Scientists taken into consideration blood pressure, heart rate, exhaled carbon monoxide, high-resolution computed tomography (HRCT) of the lungs and many other aspects and found, that vaping had no negative health effects, it actually shown results to be identical to these of the non smokers, non vapers from the control group. The results show no significant changes in lung function or structural abnormalities caused by daily exposure to electronic cigarettes. No changes in average heart rate or blood pressure was found even after 3.5 years of vaping – cigarette smokers show signs of lung damage after two years of smoking. This is the first study showing long-term effects of vaping on people who have never smoked regular cigarettes and is great news for vapers and even better for cigarette smokers who now know that e-cigarettes are less harmful compared to regular cigarettes and a good way of smoking cessation despite the previous biased news stories. The article was originally published at https://www.nature.com, research conducted by: Riccardo Polosa, Fabio Cibella, Pasquale Caponnetto, Marilena Maglia, Umberto Prosperini, Cristina Russo and Donald Tashkin. CLP – what is it? How does it influence nicotine base or e-liquid packaging design? Welcome again in our series of articles related to REACH and its obligations. Last time we explained what REACH is and today we promised to talk about CLP. What is CLP then? 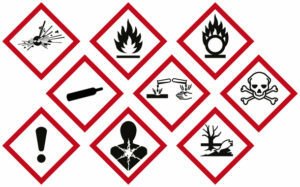 Does it influence nicotine bases manufacturers? European TPD battle – the tides are turning. Recently, there has been quite a few reassuring news from the european TPD front. Does that mean there may be a future for vaping in Europe? Polish government considers changing the upcoming regulations regarding the use of e-cigarettes in public, specifically lifting the proposed ban on vaping in public space. “A change that could be introduced is limiting the restriction regarding the ban on e-cigarette use in public space. The ban on use of the e-cigarette was the initiative of the ministry. Such regulations are not forced by the EU directive” says dr Łukasz Balwicki from the Medical University of Gdańsk. Popcorn lung – the lies we have all been told and most of us believed. We have all read the articles foreseeing painful death to all vapers due to the horrible diacetyl present in e-liquids giving everybody “popcorn lung”. During the research carried out by the National Institute of Health (http://www.ncbi.nlm.nih.gov/pubmedhealth/behindtheheadlines/news/2015-12-08-flavouring-found-in-e-cigarettes-linked-to-popcorn-lung/), the “deadly” diacetyl was found to be present in amounts above the laboratory limit of detection in 39 of 51 e-liquids tested by National Institute of Health. The diacetyl content in tested e-liquids was ranging from the detection limit, up to 239 µg/e-cigarette.